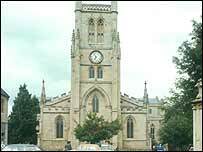 A canon at a cathedral in Lancashire has been suspended after a complaint was made against him. Canon Andrew Hindley, from Blackburn Cathedral, has been suspended from his post as the Canon Sacrist. His chief responsibility is planning services and co-ordinating the musical content of services and events. The Bishop Of Blackburn, the Rt Rev Nicholas Reade, described the suspension as a "neutral act" while an investigation was carried out. He said: "A complaint has been lodged against Canon Hindley under the Clergy Disciplinary Measure of 2003, and Canon Hindley has been suspended while the matter is examined by the designated officer. "This suspension is a neutral act, in accordance with the procedures followed in all such cases. "Obviously I am unable to make any further comment on this matter while it's being formally investigated." Mr Hindley was appointed to the cathedral in 1996 and was previously the Rector of St Wilfrid's, Ribchester.